As promised, here is the last of four Asian dishes. 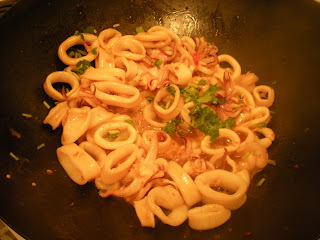 I wasn't sure what to call this dish, this is simply squid in hot sauce with a kink of lime juice. 1. 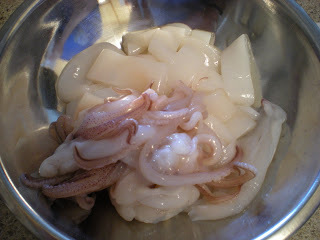 Clean, pat dry and cut squid into 1/2 inch rings. 2. In a wok or large skillet, heat oil over high heat. 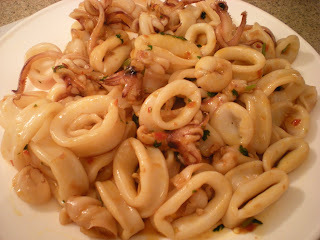 Sauté squid tubes until edges start to curl, about 2-3 mins. 3. Remove from heat. Add the remaining ingredients and toss well. Serve immediately. Looks great! I think I'll try this. We love squid. Yum squid. Spicy is good!